No additives, no flavors, all made in house; these have been our principles since the beginning, as defined by our Chef. We may cook already famous products, but we put our own spin on them, thus creating something way beyond delicious. Whether it's yummy burgers, delicious sandwiches, healthy salads or amazing pasta the end target is making wholesome food at a value proposition. Fresh and good ideas will always be appreciated. So if you think it's worth being part of our menu, let us know; write us a short e-mail intended for our Chef Vali and who knows? Maybe he'll make you both famous. We like to continuously get better... one burger at a time of course. 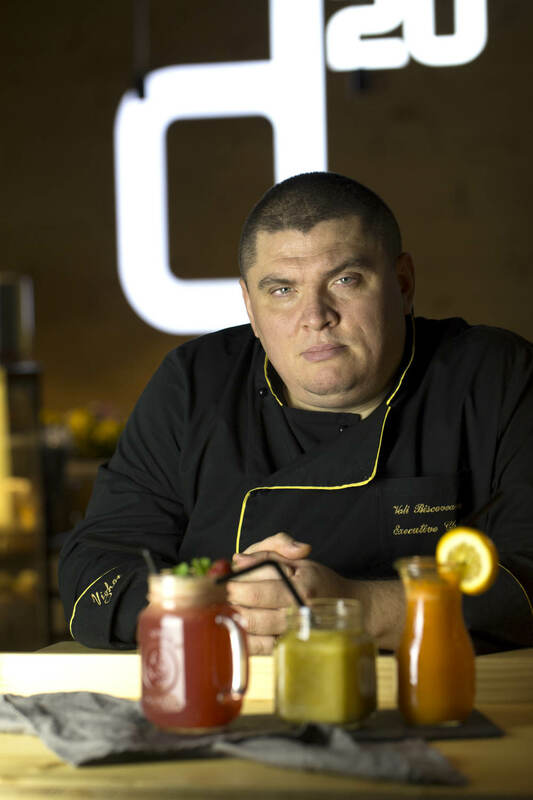 Our head chef, Vali, has been with us since the inception of d20 and has been instrumental in creating and maintaining the recipes here in d20. He enjoys the challenge of creating something new and exciting on a regular basis and playing with the mix of ingredients. Of course what he won't do is use additives and artificial flavours, just natural ingredients with their own flavours sealed in to provide fresh, natural and full flavoured food. When things were not so easy around us, we said to ourselves: "Don't sit on the couch and wait for something to come to us, go out, be daring and make a change. Smile more, be excited!" 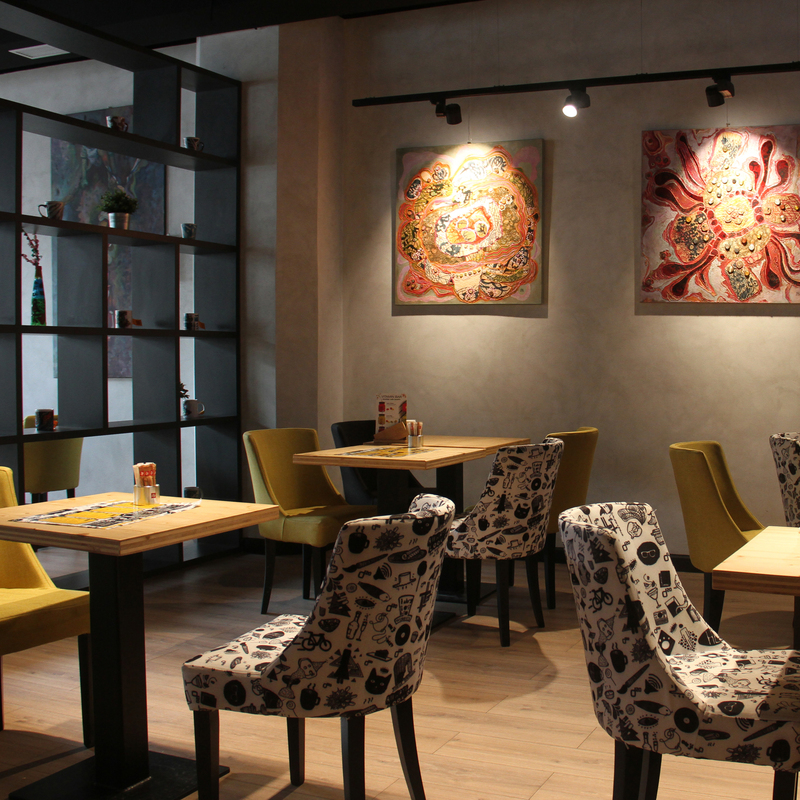 After years of being a Café scene we decided to go BISTRO, reinvent our-selves and do something different. 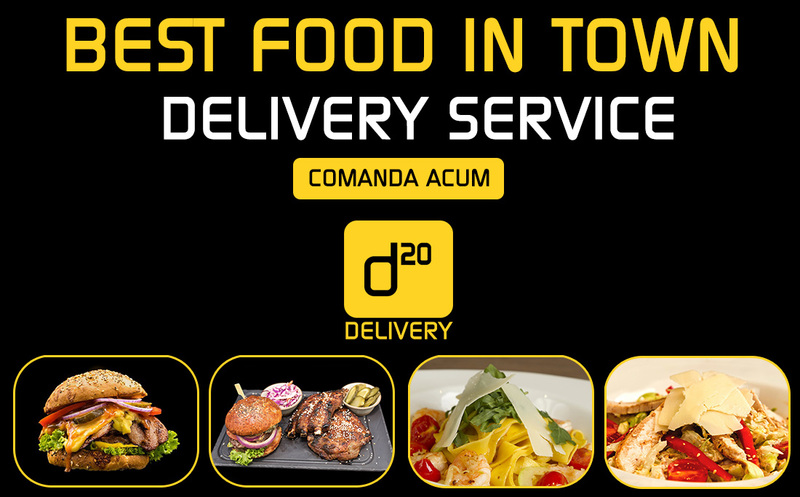 We changed the look, we changed the menu structure and we created d20 as a little oasis away from the hustle bustle of daily life to step into, take a break and enjoy a snack, a drink or a delicious meal right in central Bucharest. A little Kiwi (New Zealand) flavour, a little Ruskie (large neighbour to the north) and a whole of Romanian influence (as one would expect) comes together to provide a inner city, urban taste sensation. And it's not standing still with continuous changes being made to add to the menu and provide that little bit of difference, be it new or just a seasonal change. d20 has provided its walls to give local artists the opportunity to display their expressions of the world they see around them. We get to see Romania's budding artists who add life and colour to the walls of d20. Our customers then get to see fabulous and sometimes "dramatic out there" works by young Romanian art students, which might not otherwise get out into the real life public viewing. Special thanks goes to Contempora Gallery who organizes the students and helps set up the displays and brighten up the daily life. We just might see the next global talent developing on our d20 canvas!